Suited to the avid rider who wants the versatility of compact gearing. 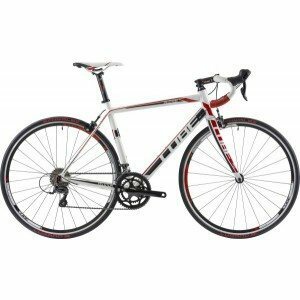 The frame features a mechanically formed down tube for improved stiffness. The tapered steerer delivers optimum stiffness and a better distribution of forces. The RFR geometry with relaxed and comfortable riding position makes riding out of the saddle safe and easy while maintaining agile handling. Made of Aluminum Superlite 6061 with an advanced mechanical forming process, the double butted frame has strength to weight- optimized tubes with an outstanding SGI value of 150.2 and comes with particularly stiff cold forged 3D dropouts. The internal cable routing saves weight, is dirt proof and delivers a clean look. The Frame Save System protects the frame by placing the threads in the replaceable hanger. Great steering precision comes from the CUBE CSL Race Carbon fork with tapered aluminum steerer. Shimano Sora 9sp 3x10 transmission gives a wide gear range. The CUBE Wing Race Bar is ergonomically shaped for better comfort on longer rides. Just got the cube today big step up from my old bike. Got it in totalcycling shop in pennyburn they were so helpful in picking the bike for me. Would recommend all cycles to go there.